An unidentified worker installs a part on a Cadillac DTS sedan at GM's Detroit-Hamtramck plant in Michigan in late 2009. In the wake of the auto industry's severe downturn, factory workers at Detroit automakers are adjusting to a new way of life - less employment security, lower starting pay and stricter work rules. DETROIT (Bloomberg) -- General Motors Co. gave Kevin Dorey's father a paycheck for 34 years, kept him working near home and let him out in time for his kids' football games. Kevin Dorey worked at three plants in three years until his most recent location in Orion Township, Mich., which required a 90-minute commute, closed in November. Previously, he would have received full pay during the layoff while GM revamped the factory for a new car. The UAW agreed last year to give up that benefit, known as the jobs bank, and the paychecks stopped coming in July. Less employment security, lower starting pay and stricter work rules signal a new era for the jobs viewed as a ticket to the middle class since Henry Ford's $5-a-day wage in 1914. The changes also mean GM, Chrysler Group LLC and Ford Motor Co. are free of the obligations that helped sink the industry in 2009 and can make money with lower sales volumes. UAW President Bob King said in June that he'll seek to win back benefits and rebuild the union's power when contract negotiations begin next year. Automakers may seek even more concessions as sales remain close to a 30-year low. In the meantime, autoworkers are adjusting to a new way of life in an industry where deliveries fell to 10.4 million vehicles in 2009, the lowest level since 1982, the year Dorey got his driver's license. Sales averaged 16.8 million a year from 2000 to 2007. Pedro Gonzales accepted a transfer in May from a GM plant in Pontiac, Mich., to one in Lordstown, Ohio, to avoid a long layoff and slipping to the bottom of the list of workers to be recalled under new union rules. For two months, he and three other workers stayed in a hotel and a two-bedroom apartment, where he slept on an air mattress in the living room. On weekends, he drove more than four hours to see his wife, mother and five children before moving them to Ohio this month. Workers previously were able to turn down transfers farther than 50 miles from their plant and remain in the jobs bank, said Sean McAlinden, chief economist at the Center for Automotive Research in Ann Arbor, Mich. There would have been 20,000 workers in the jobs bank at the start of 2010 if the program still existed, he said. Laid-off employees with fewer than 10 years of experience now get partial pay for 26 weeks, while those who've worked longer can get paid for as much as a year. Workers then move to a transition support program, about equal to collecting unemployment, for an additional 26 weeks to one year, McAlinden said. Wages also are declining, with new hourly production workers starting at $14 an hour instead of $28. The combined cuts reduced Detroit-based GM's average labor cost to $58 an hour from $74 two years ago, McAlinden said. The new $14-an-hour workers, which could account for 20 percent of the labor force eventually, will drive GM, Ford and Chrysler's hourly costs below the $56 for Toyota Motor Corp.'s most senior U.S. hourly workers, he said. GM is now positioned to break even during troughs in demand, Chief Executive Officer Ed Whitacre, who will cede the title to Daniel Akerson next month, said in June. Ford will be “solidly profitable” in 2010, CEO Alan Mulally has said. Those improved prospects are setting up a fight during contract talks in 2011. Ford, the only U.S. automaker that didn't file for bankruptcy or receive government assistance last year, is seeking parity with GM and Chrysler, which won a freeze on wages for new hires until 2015 and a prohibition on some strikes for five years. 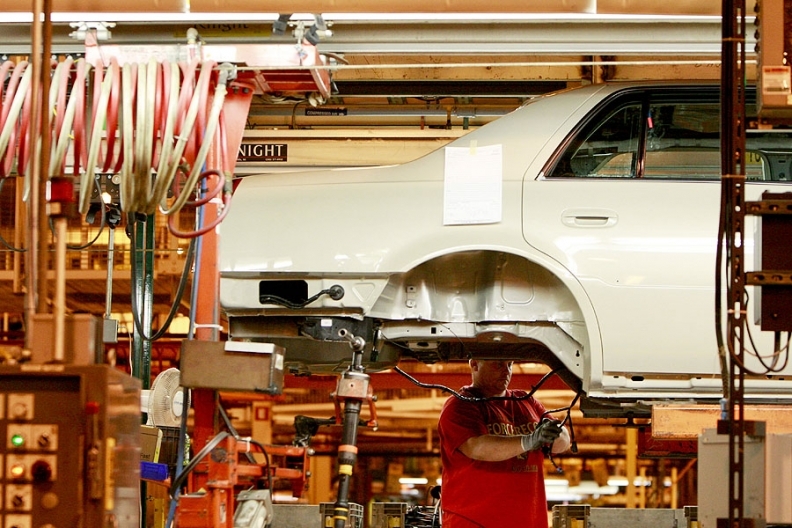 The union wants automakers to restore some of the pay raises, annual bonuses and cost-of-living adjustments it surrendered to keep the companies afloat last year. “It's really important to understand and stress that all the auto companies were profitable and successful paying the wages and benefits they did when they had good product and product the customer wanted,” King said in an interview at the UAW's Solidarity House headquarters in Detroit. He declined to specify which benefits he'd seek in the negotiations and said he didn't think it was possible to get back everything the union gave up. Union leaders likely will be successful in clawing back some compensation and benefits, said Bob Schulz, an auto analyst for Standard & Poor's. “It's going to raise costs, it's just a question of how and how much,” he said. Union leaders and workers looking to win back concessions are stuck in a “time warp,” said David Littmann, senior economist for the Mackinac Center for Public Policy, a research organization in Midland, Mich., that promotes free-market principles. “They want to make things the way they were, and they're not,” Littmann said. The jobs bank, which had a combined 25,000 Ford, GM and Chrysler workers at its peak in the early 1990s, was originally designed to retain trained workers who were temporarily displaced by productivity or business cycles. The program later became a symbol of the benefits union workers received as the U.S. government debated approving funds to save the industry. The program's stigma and the nation's 9.5 percent unemployment rate will make it difficult for the union to win back some benefits, he said. Dorey, who said he was never in the jobs bank, said he probably will be on the second shift when production at the Orion plant restarts next year. He'll start work in the mid- afternoon and won't get home until 4 a.m., leaving the divorced father little time to spend with his 11-year-old son.